A property developer Wednesday decided it will move forward with its own plan to revitalize the decades-old Vallco Mall in Cupertino, passing over a plan approved by the city after residents gathered enough signatures to fight it with a referendum. 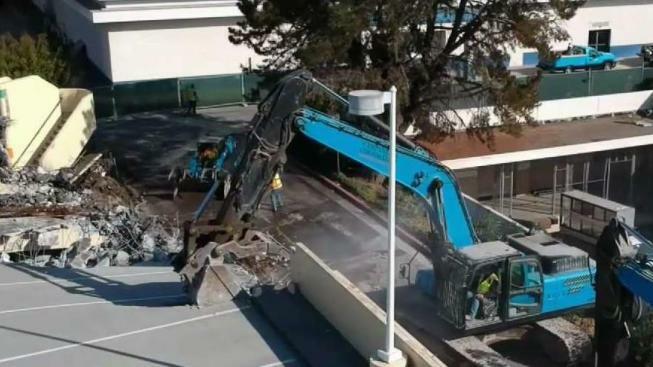 The project had been plagued with years of delays before developer Sand Hill Property began demolition at the site about three weeks ago, shortly after the city approved its plan. Sand Hill's plan is modeled after affordable housing regulations in California Senate Bill 35. Sand Hill Property officials hadn't publicly announced which plan they would choose until today, when owner Reed Moulds said the company has been enthusiastic about working on a collaborative plan with the city, but would no longer consider a plan bogged down with delays caused by a referendum. "This latest obstruction, and the 2-year delay it causes, gives the Community Plan no chance to catch up to the already approved and underway Vallco Town Center project," Moulds said in a statement. "We consider ourselves patient people, but our patience has finally run out." Political action committee Friends of Better Cupertino rallied to collect over 5,000 signatures, deeming the city's plan "aggressive" and calling for voters to defeat it during the November election. If the signatures are approved, the city can either withdraw the plan or place it on the ballot. Sand Hill Property officials said they are "saddened" the referendum crushed a community plan that was supported by many. Both plans allowed for about 2 million square feet of office and commercial space, but Sand Hill's plan, which has about 2,400 housing units to the city's 2,900, is one of the first in the state to be approved under a 50 percent affordable housing mandate in SB 35. The SB 35 plan does not require the community benefits that area tied to the city's plan, such as donations to the Cupertino Unified School District or open space regulations. But the company plans to give the school district a $14.25 million cash gift and educational infrastructure at the Vallco Town Center. The mall was originally built in the 1970s but slowly became a miniature ghost town after the departure of large department stores like Sears over the last 20 years. It's located about 1 mile away from Apple headquarters, in what has become prime real estate for the city, and Sand Hill Property hopes to create a new shopping and living hub for Cupertino residents. "We know that there may be some disappointment about this, but we also take heart in knowing that, once complete, Vallco Town Center will be a remarkable destination, fully embraced and utilized by Cupertino, even its detractors," Moulds said.